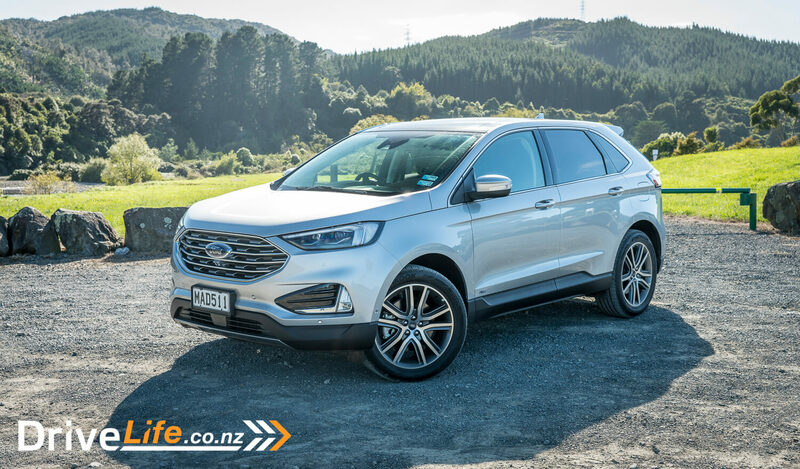 As the replacement for the Ford Territory, the rest of the world know this car as the Ford Edge. Now available in Australia and New Zealand, it’s being sold under the model name Endura. 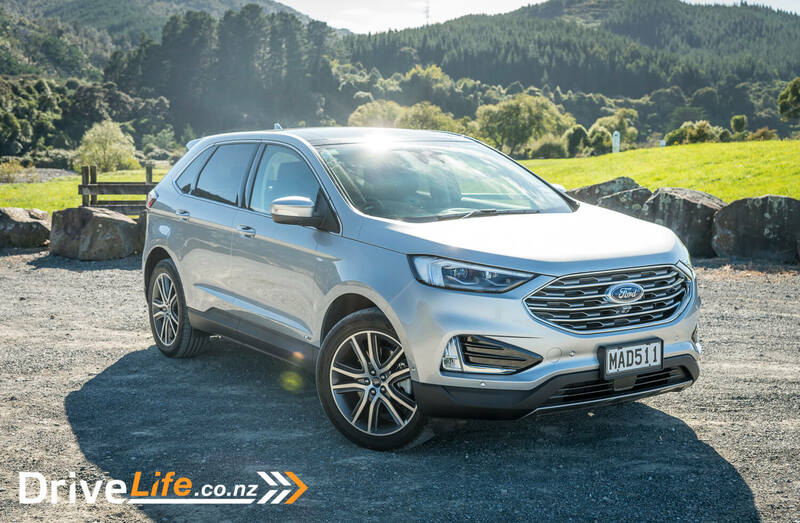 Can the Endura stand up to the legacy of the old Territory and how will it compare to other brands in the massively expanding SUV market? In New Zealand, there are 4 variants of Endura to choose from. The range starts with the Endura Trend FWD ($53,490) and the Endura Trend AWD ($56,490). 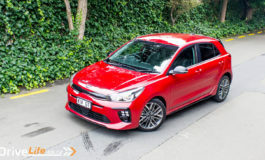 It then moves up to the sports and luxury model, the Endura ST-Line AWD ($64,990) and the Endura Titanium AWD ($69,990) . All Endura models come with the same 2.0-litre turbo diesel engine that produces 140kW of power and 400Nm of torque. They also all have the same 8-speed automatic transmission. Each variant builds on the spec of the previous one. 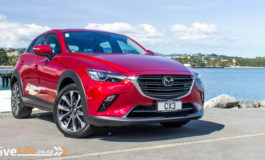 Stating with the Trend FWD, the main features are adaptive cruise control, autonomous emergency braking, integrated active noise control, push button start with keyless entry and a towbar. 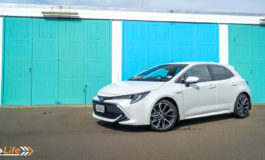 The Trend AWD adds intelligent all-wheel drive to the line up already available in the Trend FWD. Moving to the ST-Line you get a bit more again, 20″ alloy wheels with black inserts, black trapezoid front grille and surround, enhanced park assist with pull out assist, perpendicular park and flankguard, front heated & cooled seats with 10-way power adjust (driver & passenger), full sports inspired body styling kit, Miko Suede perforated seats with leather accents and sports-tuned suspension. 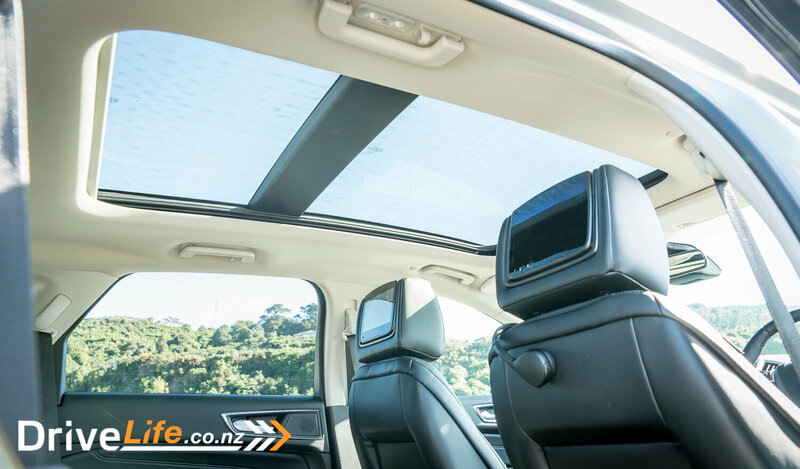 dual panel power open panoramic glass roof with power shade, heated 2nd-row seats, power tailgate with handsfree operation, premium B&O 12-speaker audio and rear DVD Headrest Entertainment system. My first impressions were a bit skewed, as I normally try to avoid any info about the vehicle before the pickup. However, the forms for the review car had the details and colour of the car on it. Ingot Silver, not the most exciting colour I thought to myself. Upon first glance, I must say, Ingot Silver looks great. It really highlights the strong shapes and forms of the Endura. It was also offset nicely by the two tone colour on the lower front / rear bumper and side sills. This gave it a big strong stance and rather eye-catching too. I liked how this car looked, it was big, without feeling big. 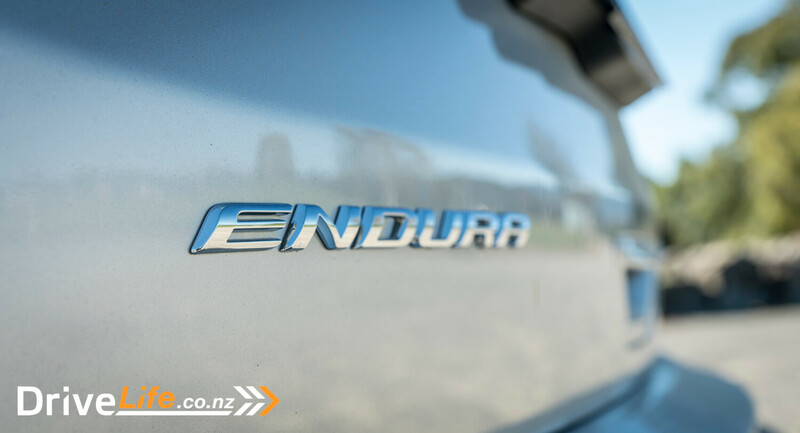 I was keen to get behind the wheel and see what else this new Endura had to offer. Climbing into the huge Endura, you notice that it has a high spec level and luxury feel. First thing was the seats, wow they felt really nice. It had a sumptuous, rich comfy feel to them, not too soft and not firm, just right. The space just for the driver was huge, made even bigger as the driver’s seat pulls back when entering and exiting the car. The rear seats were just as nice, perhaps not as sculpted as the two front seats but they all felt just as comfy. They were also heated, which was great to see. No cooling back there, but the leg room was to die for, it was massive. Even with the driver’s seat set back in a tall driver’s position, I could sit in behind and my knees didn’t even touch the driver’s seat. That’s impressive, and that is also what many of the 7 seaters SUV’s lack these days. The focus is on getting 7 seats in, not about how average people will feel when sitting in them. 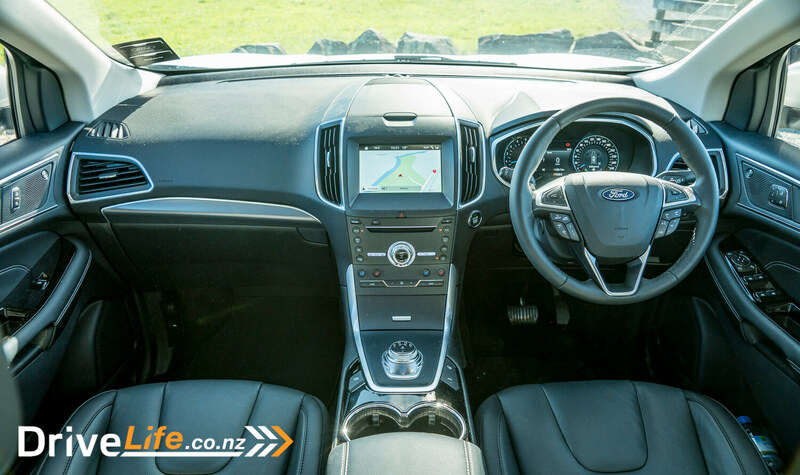 To add to the impressive rear space, the two front seats have DVD Entertainment System built into the back of the headrests. Both screens come with wireless headphones too. This is perfect for the kids on small or long trips. It’s a plus if you only have two kids, they don’t have to share. This really took me by surprise, as its standard on the Titanium spec Endura. It’s hard to find these options on luxury SUV’s these days, and if you do they are usually expensive options. Back in the front, I found myself on the fence about the gear selector dial. It was somewhat like the Jaguar/Land Rover gear selector dial, with a lot more chrome. The functionality worked ok, and the removed gear stick made the cabin feel more open. Over the course of the week, I got used to it, with my actions become more fluid. I did put it in the park a lot when looking for reverse. This happened on sunny days when it became impossible to see the light in the dial so that you could see what selection you had made. The central media screen in was a bit disappointing when you put it in perspective to the rest of the vehicle. It’s a full-colour LCD screen, and the UI or interface has been designed to use around 3 shades of blue. The only app the seemed to use more colours was the navigation map. This made the interface feel very dated. 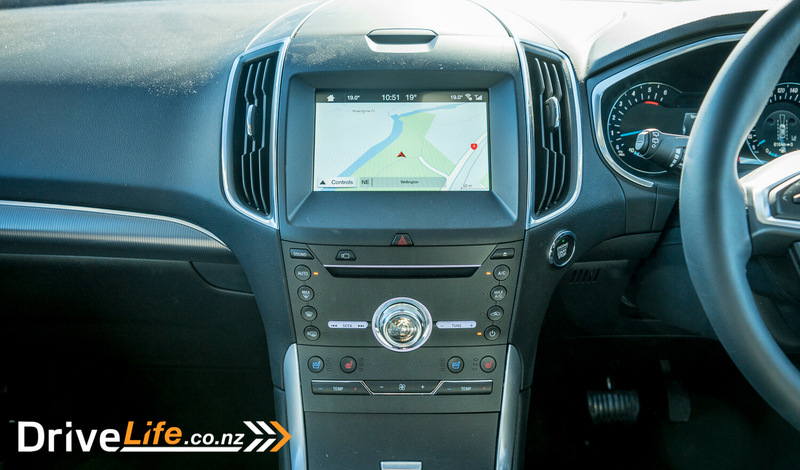 When compared to other SUVs at this price tag, their interfaces are more visually appealing and colourful. Where the media screen lacked the B&O 12-speaker audio system made up. For those who don’t know, B&O is a top-shelf brand that caters for the upper class with an expensive line of audio equipment. The system in the Endura was impressive, sound quality was great, clarity was amazing and the bass was perfect. It has to be the best sound system available in this price bracket. The panoramic glass sunroof was perfect, almost the full length of the main cabin. My one and a half-year-old daughter loved this, especially in the rain. 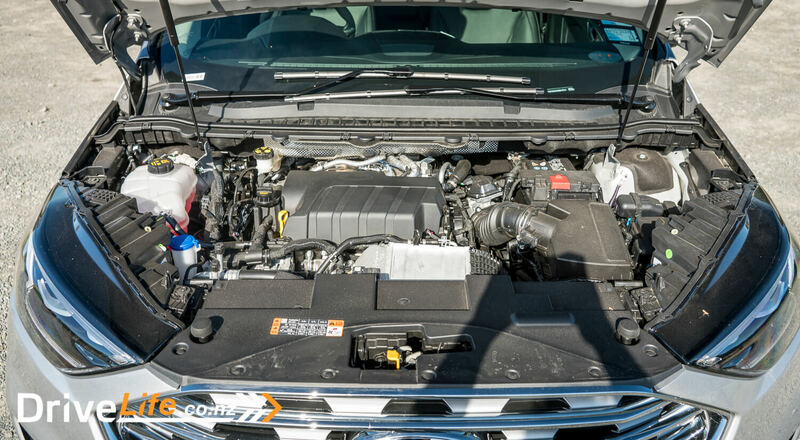 This is an impressive option to have as a standard spec level, in many other vehicles, even more, expensive vehicles it would be a $3k-$5k option. Navigating the menus and options was easy enough by the touch screen. There was a home screen that shows the map on half of the screen and on the other side the radio and phone linked via Bluetooth. All of the features and options are typical of this kind of vehicle, with only one odd item encountered. When using my phone, the previous dialled list reset every time I started the car. It did not seem to source the list of dialled numbers from my phone. Hopefully, this is an option, but I was unable to find anything. The driver information cluster was nice, oddly more thought-out compared to the central media screen. On the left, you have an RPM gauge and on the right, you have a speedo. Within and between these dials, there are LCD screens. Inside the speedometer, there is a display that indicates what safety systems are enabled; lane assist, cruise control, etc. There is also the fuel gauge at the bottom of this display. In the middle there is a menu that allows you to select and display different information, I left this on the digital speedo most of the time. On the right, it displayed a needle for the RPM gauge, however, when selected you could display other info like the fuel consumption. The rear seats have a typical 60/40 split, which also allowed the seat back to be adjusted for comfort. 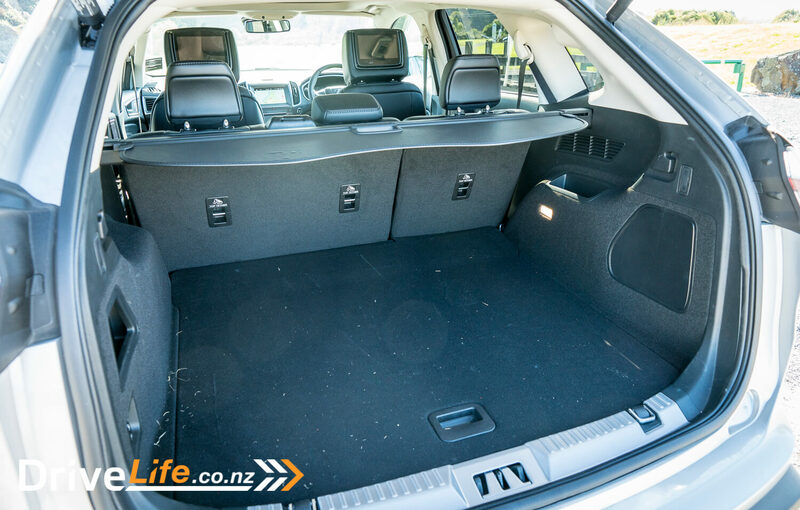 When the seats are up, the boot boasts an impressive 800-litre capacity. And when the back seats are down, this grows to a whopping 1688 litres. There won’t be many things you can’t fit in the back of this SUV. We found the boot space really good even with a large buggy. If there are items in the back, you can cover them with a pull-over parcel shelf. Behind the wheel of the new Endura, you felt in control and safe. Visibility was good all around, aided the standard blind spot monitoring system and cross traffic alerts systems. This beast is actually nice and easy to drive. Power from the diesel engine was great. Nothing mind-blowing, but its 140kW of power and 400Nm of torque never felt sluggish. What was also nice about this engine, is that it didn’t really sound like a diesel. It did not sound as quiet as a petrol engine, but it was somewhere in between. Diesel is great for range, and over the week in the Endura, and the 400km I travelled, there was still more than half a tank left. 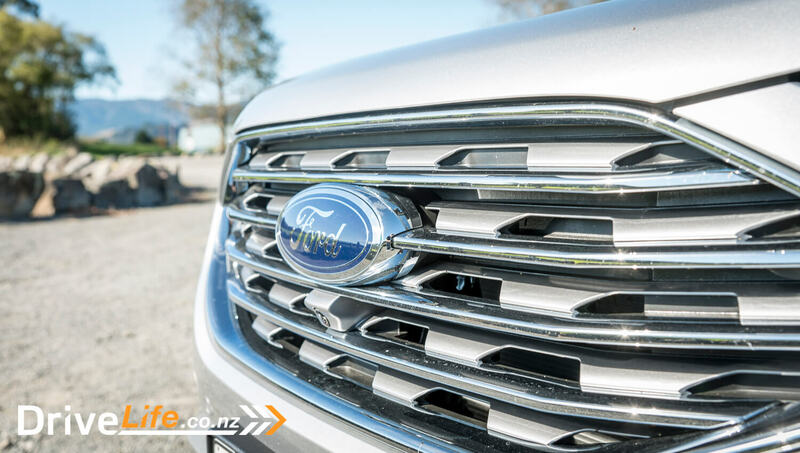 Ford state it has a 6.7 L/100km combined fuel rating, I managed to maintain 8.2 L/100km. I felt this was pretty good for such a large vehicle, however I think if the engine came with auto stop/start it would help to improve those real-world figures. The ride was great, very comfy, with enough feel from the road to allow feedback. The vehicle itself felt high, but there was a distinct lack of body roll during my daily drives. I was never left feeling that I needed to hang on to the wheel as we went around the next bend. The ride quality was also reflected in the sound level within the cabin. Road noise was minimal and wind noise was barely audible. This was a very peaceful, relaxing place to be. The steering wheel had a lot going on, most of it was easy to use. The buttons under the left and right direction thumb toggles where a bit awkward to get at. I found that I had to lift my hand from gripping the wheel just to trigger some of these buttons. There is room to simplify this, as I feel they might have tried to put too many buttons on the wheel. Of course, it also has paddle gear selectors on the wheel, why we will never know. It’s just not required on this sort of vehicle. One item that surprised me for the spec and price of the Titanium, was that it did not come with any auto-hold park-brake. Really… almost every other SUV on the market has this, why doesn’t the Endura? I found this out the hard way too when getting out of the vehicle on my driveway which has a slight incline. The entire vehicle rolled forward until the park gear kicked into place. This seems like an oversight to me, why not have this, when there are so many other options in the Titanium-spec Endura. In the centre of the new gear shift selector was a button labelled with an S. This can only be Sport mode, and it wouldn’t be right of me not to fully test this feature. Before testing this I remembered that it’s diesel and not a performance diesel. I set my expectations low and pressed it. It was a good thing I did have low expectations, as the only thing that changed was the gear change, remaining longer in a lower gear for higher RPM. I am not even sure if it was responding faster or just being noisier. Thankfully I knew to go into this part of the test, it was not a sporty vehicle. Over the week, I started to notice a sloshing sound, at first I didn’t know where or what it was. But then it clicked, it was the diesel in the tank moving around. It’s been a long time since I have heard the fuel in a car moving around, and very surprised that I heard it in this vehicle. The Endura is a big vehicle, but it’s not as big as it feels. I am used to driving many different sizes of vehicles, and this was one of the first that I was unsure about in multi-storey car parks. I found that the curve of the bonnet towards the centre and the high position of it, made it feel like the front was further away from the driver. The large windscreen and its position aided this feeling too. I got used to it, but there were a few moments with my head out the window to check for the kerbs on the multi-story ramps. It’s great to see that there are still some large SUVs that are not forcing you to have seven seats. If you don’t want seven seats or even need them, why waste the space and cost on having them? 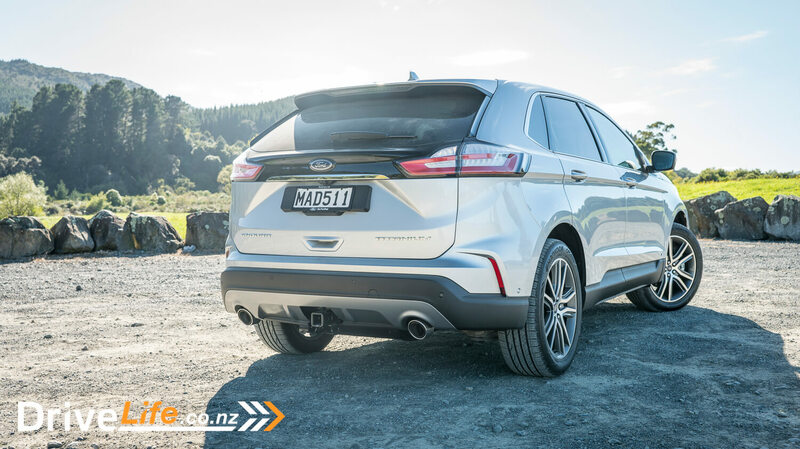 This is a great small family large SUV, something which is becoming harder to get these days. The downside to this price bracket is that the competition has a lot of really great alternative options. If you’re looking for a large 5 seater SUV, you have to try it. You might find that this one ticks all of your boxes.